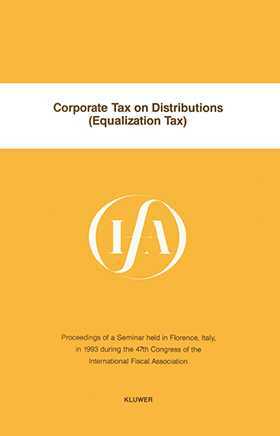 This volume of the IFA Congress Seminar Series is centered on corporate tax on distributions and contains the reports that were presented at an IFA Congress Seminar held in Florence in 1993 entitled Corporate Tax on Distributions: Equalization Tax. This type of tax was created with the intention of correcting possible distortions when shareholders receiving the dividend obtain a tax credit. Both the imputation system and the equalization tax may cause problems in the countries that have adopted that type of tax system and have an equalization tax or its equivalent. The problems that may occur were analysed with respect to five countries and represented by an international panel at the congress. The reports of the Australian, French, German , Italian and British panel members are included in this IFA publication.